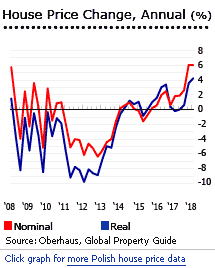 Housing demand in Poland continues to rise robustly due to the country's excellent economic performance, wage rises and declining unemployment, combined with historic low interest rates. The average price of existing flats in Poland's 7 big cities (Warsaw, Gdańsk, Gdynia, Kraków, Łódź, Poznań, and Wrocław) increased by 6.9% (5.1% inflation-adjusted) during the year to Q1 2018, according to the Polish central bank, Narodowy Bank Polski&nbsp;(NBP). During the latest quarter, house prices were up by 2.7% (2.2% inflation-adjusted). 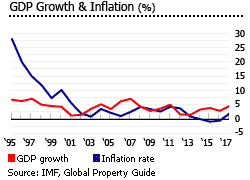 In Warsaw the average price of existing houses rose by 6% (4.2% inflation-adjusted), during the year to Q1 2018. Gdańsk saw the highest house price rise of Poland's seven major cities, with a 17.5% y-o-y price surge in Q1 2018. It was followed by Krakow with a 13.2% y-o-y increase. Other Polish major cities also enjoyed high price hikes, including Poznań (9.3%), Łódź (7%), and Gdynia (6.9%). Among the 7 big cities, Wrocław saw the lowest price hike of 2.7% (1% inflation-adjusted) during the year to Q1 2018. Warsaw has Poland's most expensive housing, with an average selling price of PLN 9,346 (€ 2,158) per square metre (sq. m.) in Q1 2018, according to NBP. Housing is also expensive in Kraków, with an average price of PLN 7,767 (€ 1,793) per sq. m., Gdańsk with PLN 7,712 (€ 1,780) per sq. m., and Gdynia with PLN 7,293 (€ 1,684) per sq. m.
Wrocław had the cheapest houses among the 7 big cities, with an average price of PLN 6,423 (€ 1,483) per sq. m.
The price rises are due to rising demand, supply shortages and higher construction costs, as well as a declining share of low-cost &quot;Housing the Young&quot; (MdM) scheme units, after the programme closed in January 2018. Foreigners can freely buy condominium units in Poland. Land for commercial purposes can be freely bought by citizens of the European Economic Area (EU + Iceland, Liechtenstein, and Norway). Gross rental yields, i.e., the gross return on investment in an apartment if fully rented out, in the centre of Warsaw, are 6.0% for a 90 square metre (sq. m.) apartment. Such an apartment might cost around EUR 1,200 per month to rent, but around EUR 235,000 to buy. There are similar yields on 120 sq. m. apartments, though prices and rents are obviously higher. These are good yields. Such good yields are obtainable in all Warsaw's central areas such as Mokotów, Śródmieście, and in other areas too. 6% is the normal yield throughout the city, and very small apartments are likely to yield even more (though we don't have the research to substantiate this). Surprisingly, the same is true of Krakow. Apartments here are broadly similar in price to the less central areas of Warsaw. They return rents of around EUR 11 - EUR 12 per sq.m. per month. A 90 sq. m. apartment in Krakow will cost you around EUR 200,000, and rent for around EUR 1,100, producing a yield of 6.5%. The big downside is that round trip transaction costs are high in Poland. See our Poland transaction costs analysis and our Transaction costs in Poland compared to other countries. Rental Income: Net rental income is taxed at progressive rates, up to 32%. Capital Gains: Capital gains incurred on properties sold within five years of acquisition are taxed at a flat rate of 19%. Capital gains incurred on properties sold after a 5-year holding period are exempted from capital gains tax. Residents: Residents of Poland pay taxes on their worldwide income at progressive rates, up to 32%. Roundtrip transaction costs, i.e., the cost of buying and selling a property, are around 5.35% to 8.10%, with all costs falling on the buyer. For residential apartments, real estate agent’s fee is typically 3%. Rent: Rents can be freely negotiated between landlord and tenant. Rent indexation clauses are legal. Tenant Security: However, the general situation over rental laws is worryingly unstable. Strict re-regulation of the rental sector was recently legislated by Parliament. Fortunately, it was declared unconstitutional shortly after coming into law. Populist pro-tenant feeling is strong. The Polish economy expanded by 4.6% in 2017, its fastest growth since 2011, according to the Central Statistical Office of Poland. Growth was supported by robust domestic demand, a rise in fixed investment due to increased European Union funds, as well as the stronger economic activity of Poland's neighbouring countries and main trade partners. The European Commission expects an expansion of 4.3% in 2018. During Q1 2018 the economy expanded by 5.2% y-o-y. Poland, which does not use the euro, is the only European country that avoided recession during the global financial and economic meltdown. The Polish economy expanded by 4.3% in 2008, 2.8% in 2009, 3.6% in 2010 and 5% in 2011, according to the IMF. However growth slowed in 2012 and 2013, with GDP growth rates of just 1.6% and 1.4% respectively, due to the recession in the Eurozone, which accounts for over 50% of Polish exports. The Polish economy bounced back in 2014 with 3.3% growth, fueled mainly by strong domestic demand. Economic expansion continued in 2015 and 2016, posting growth rates of 3.8% and 2.9%, respectively. Poland's budget deficit stood at 1.5% of GDP in 2017, the lowest since the beginning of Poland's data collection in 1995, according to the Central Statistical Office. The government debt was trimmed to 50.6% of GDP in 2017, from 54.2% of GDP in 2016. Core inflation fell to 0.5% during the year to May 2018, according to the central bank. In May 2018, Poland's unemployment rate hit a 28-year low at 6.1%, down from last year's 7.3%. In contrast to Poland's booming economic performance, its political situation is clouded with uncertainty due to the growing strain between the country and the European Union (EU). In December 2017, the EU recommended launching an unprecedented disciplinary process against the Polish government due to the latter's judicial reforms, which the EU calls a "clear risk of a serious breach of the rule of law". The conflict has been brewing since the populist Law and Justice Party (PiS) candidate Andrzej Duda won the presidential elections in May 2015 and the PiS party won the majority of seats in November 2015. Softening the tension between Poland and EU is the task for Poland's new Prime Minister Mateusz Morawiecki, who replaced former Prime Minister Beata Szydło after her resignation in December 2017. Poland, the biggest beneficiary of the EU funds, may otherwise see its funds cut in the new 2021-2027 EU budget.